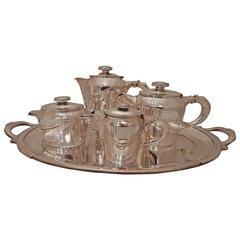 Very good quality 3-piece Art Deco silver plated teapot, sugar bowl and creamer in the style of sets by Gallia, Christofle. Each piece is stamped. The teapot and sugar bowl bear Signature & Marks: Triple Deposit Princes Plate, 1 rue de la Paix, Paris imported from Angleterre (England). Good condition consistent with age. Slight fading on the creamer (see photographs). Measurements: Teapot 11" W x 7 3/4" H x 5" D Creamer 2 1/4" height x 2 3/4" diameter Sugar bowl 6 1/2" W x 3 3/4" H x 3 1/2" D Makes a wonderful gift or add to your collection. This set will grace your table and delight your guests. Silver plated tray, marked Very good quality in perfect condition. A fine collectible item. Quality late 18th-early 19th century French pewter plate, in good condition although slightly scratched from use. Stamped.